Ok - against all instructions from doctors and husband and friends, I did a very quick and very painful try on of my Hush order. Not only because I knew you were all waiting to see how I got on with my order but also because I knew some of it was going back and I needed to return it promptly. 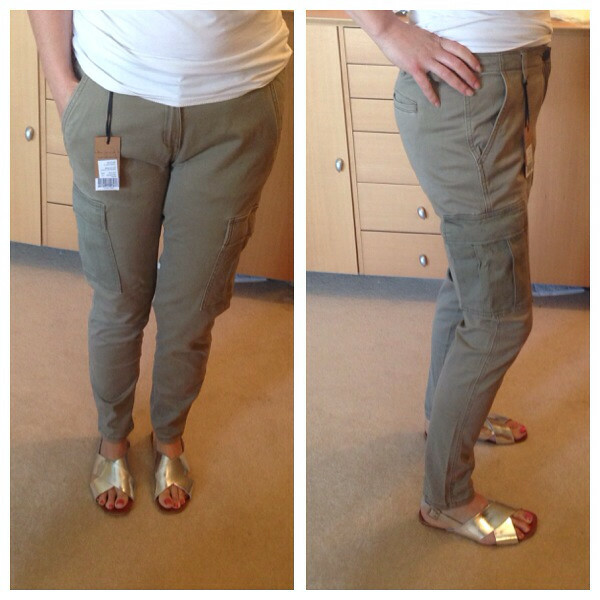 First up - the cargo trousers. Now these don't get the best reviews and the advice was to size down. I ordered a 10 and they fitted perfectly and I have to say that I really do like them as an alternative to jeans but they're still a bit pricy for me at £50 as I'm not sure I'm going to wear them *that* much realistically. 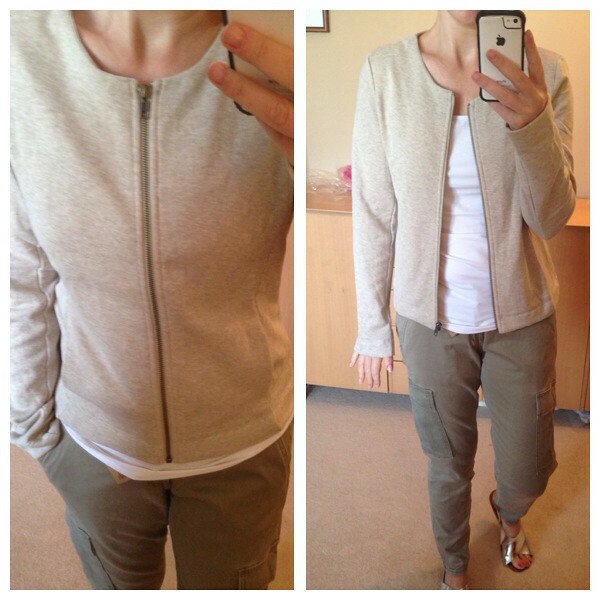 The quality is great - don't get me wrong - lovely soft material with a bit of a stretch. But I've overspent a bit on the sales to date so they will have to go back. 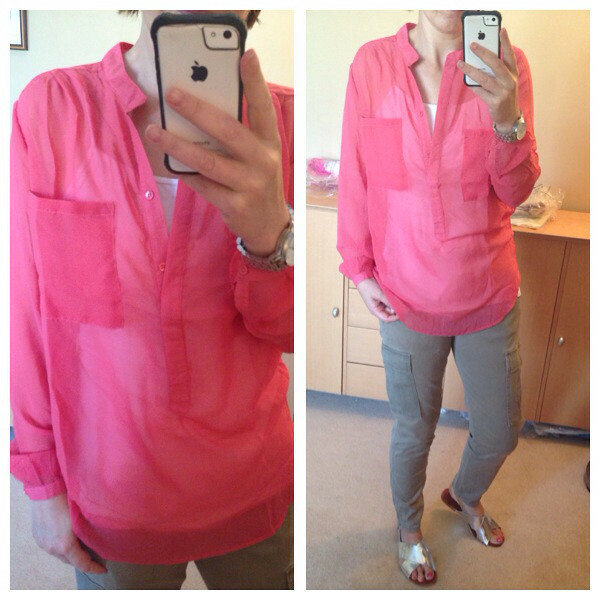 Next up - the chiffon blouse - this was the only item where quality was an issue for me. This just didn't have the feel of a £60 top...it's reduced to £40 now but it's still not good enough. At £20, I might consider it as I loved the colour but it's very transparent and a little long for wearing untucked. Would make a great beach cover up actually. 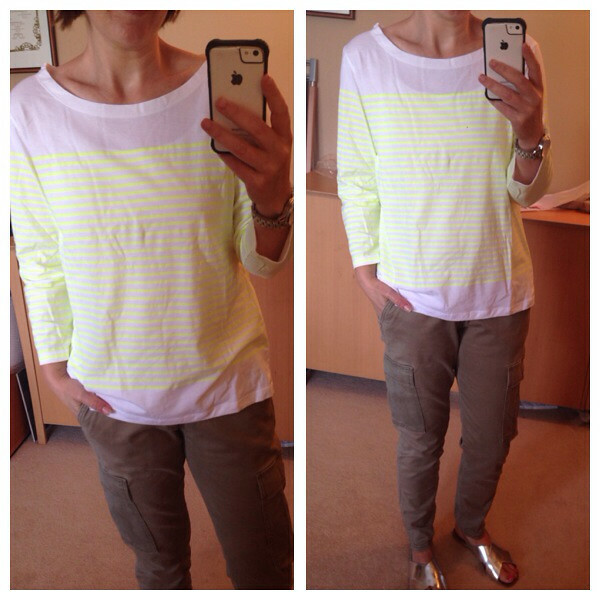 The fluro stripe tee is just as lovely as I'd hoped but too large in the M/L. I see it's back in stock in the S/M so I would like to exchange it for the smaller size. Love the cut of the neckline and the shape. 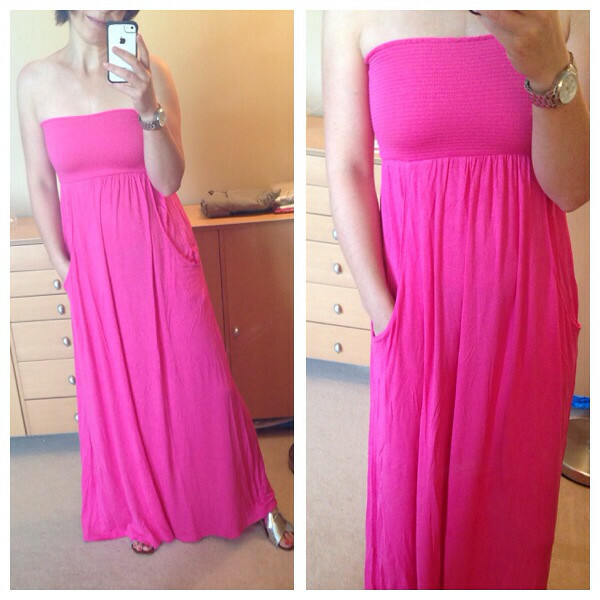 Finally - the surprising star of my order - the jersey maxi dress in fuchsia - love it! I don't do strapless stuff normally but this is a really firm, secure strapless dress yet it doesn't push any excess out under your arms or above the top of the dress. It's a perfect length - I'm wearing with completely flat sandals (5'6 and three quarters!!) and the jersey is a nice weight, not clingy and not see-through. And it has pockets. SOLD. I cannot wait to wear this with a denim jacket once I'm mobile again - and the autumnal weather moves on. Sales advice - keep checking back to the sales you love to see if things have reduced further or have come back into stock in your size. I've just noticed the Serrano sandals in Boden are now down to £17.70!!! Before I sign off - thank you to everyone for your all your kind messages and comments. Emails, blogs and social media are all really helping this rest time to pass faster. 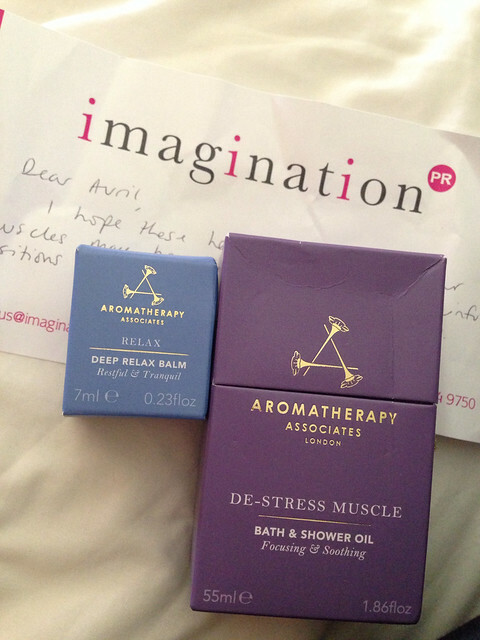 A special thank you must go out to Steph at Imagination PR for the Aromatherapy Associates gift she sent to me yesterday to aid restful sleep and destress my muscles. 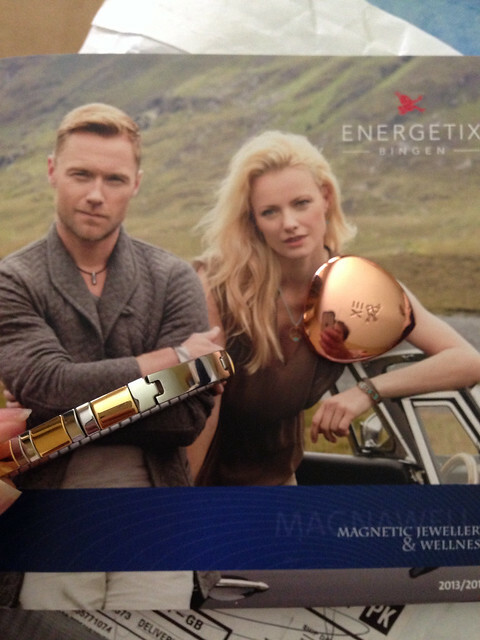 And a thank you to Lizzi from Energetix magnetic jewellery who heard about my sciatic troubles and sent me a magnet to place at the top of my sciatic nerve, as well as a magnetic bracelet. And yes, that is Ronan Keating on the brochure...my friend Catherine's going to want to steal this I know! Oh Dear! You do suffer for your art lady. Have to agree with the pink dress though, amazing colour on you. GO BACK TO BED!!!!!!!!!! You're very bold! But while I'm here, just want to say the maxi looks fab .. shame about the jacket ... and really??? Are you sure you wouldn't buy the trousers? They were my favourite item and I think you'd be surprised by how much wear you'd get out of them ... and if you didn't buy the stripey tee (seriously, how many stripey tees do you already own?!) then they wouldn't seem quite so expensive (and this is why I'm not an accountant!) Now please stay in bed and work on getting your back sorted! Love the maxi dress - really gorgeous! I I also like the look of those cargo trousers - am going to have a look at their site now to see if they still have any 10's left! Avril, rest up and hope you will be out and about again and able to show off all your sale bargains. The trousers are really lovely on you , as is the pink Maxi dress. Get the rest packed up before you are tempted to keep them ! Get well soon. Hope those cargo trousers and striped top are now returned Avril. I avoid fuchsia but that dress is great on you and a keeper definitely. Thanks for sharing your honest reviews of Hush.